When it comes to training robots, you could grab a joystick or carefully program movements in code. The better way, though, is to move the robot yourself, and have the robot play back all those movements ad infinitum. This is training robots by touch, and it’s the subject of this week’s Hack Chat over on hackaday.io. Our guest for this week’s Hack Chat will be [Kent Gilson], inventor, serial entrepreneur, and pioneer in reconfigurable computing. [Kent] is the creator of Viva, an object-oriented programming language and operating environment that harnesses the power of FPGAs into general-purpose computing He’s launched eight entrepreneurial ventures, won multiple awards, and created products used in numerous industries across the globe. [Kent]’s claim to fame on hackaday.io is Dexter, a low-cost robotic arm with 50-micron repeatability and modular end effectors. It does this with three harmonic drives and optical encoders that give it extreme precision. The arm is also trainable, meaning that you can manually control it and play back the exact path it took. 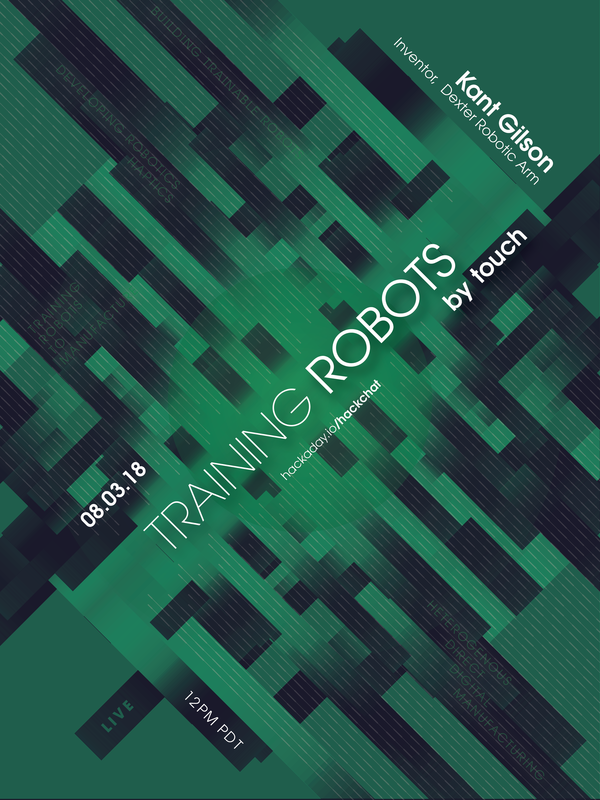 It’s training robots by touch, exactly what this Hack Chat is all about. Our Hack Chats are live community events on the Hackaday.io Hack Chat group messaging. This week is just like any other, and we’ll be gathering ’round our video terminals at noon, Pacific, on Friday, July 27th. Need a countdown timer? Well, here you go, mango. I love the poster thing for this, really well done.